For all you foodies out there, yesterday was National Homemade Soup Day. On a cold winter day, nothing is better than a bowl of homemade soup. 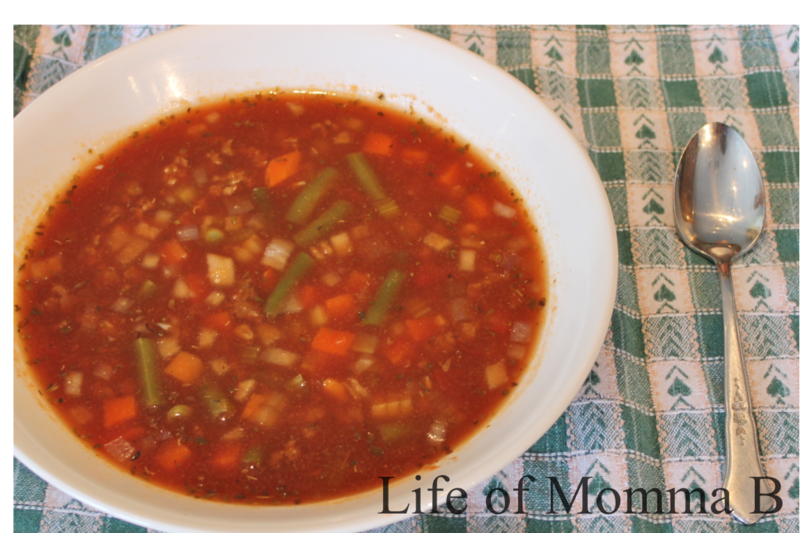 A family favorite around my house is Hamburger Vegetable Soup. It has enough meat to keep the hubby happy and lots of vegetables (carrots, corn, green beans, peas, and celery). I love the recipe because I can throw it in the slow-cooker and have dinner on the table when the hubby gets home from work. Dissolve bouillon in water. Add all ingredients to slow cooker. Cover and cook on low for 5 hours. The next time the weather is cold and rainy, mix up a batch of Hamburger Vegetable Soup and stay warm. Here is the recipe card (Hamburger Vegetable Soup) to add to your collection. This entry was posted in Recipes and tagged beef, carrots, celery, gluten free, green beans, main course, one pot meal, peas, printable, recipe card, slow-cooker, soup, tomato, vegetable. Bookmark the permalink.